Prepare Grill. Blend tablespoon of salt with the half of lemon zest and rosemary and rub this all over the fish fillets. Chill for an hour. Black Olive Sauce- Mix all the ingredients except the vinegar together. Add vinegar to taste. Lemon Gremolata – With remaining lemon zest, combine with all ingredients. Pat the fish dry with some kitchen paper, wiping off the excess salt and then pat it with a little olive oil. Grill over medium coals for about 3 minutes on each side, depending on the thickness. 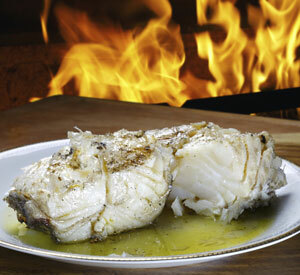 Serve the Cod on the Black Olive Sauce and garnish with Gremolata. Recipe courtesy of McPherson Winery. With a focus on traditional winemaking craftwork and state-of-the-art technology, McPherson wines are made to be easy-drinking, fruit driven styles with generous mouth-filling flavors. 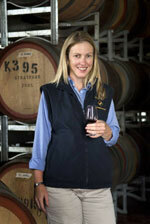 For almost 40 years the McPherson family have been committed to producing high quality wines with an affordable value. This wine was crafted from 100% Chardonnay grapes, sourced primarily from vineyards in the Murray Darling region, located within South Eastern Australia. Grapes were picked and crushed during the cool of night so as to retain their fresh, varietal flavors. A delightful, fruit driven wine displaying aromas of tropical fruits and peaches with just a hint of lightly toasted oak. McPherson Chardonnay is a versatile wine that pairs well with a wide range of foods. Try with roast chicken and grilled fish. “The palate exhibits fresh, ripe Chardonnay flavors of melon and fig with a delicate, creamy texture and a crisp, clean finish. Subtle oak handling complements, rather than overpowers the wine”. This entry was posted in Recipes and tagged australia, chardonnay, chris cameron, cod recipe, food pairing, jo nash, McPherson, olive sauce, recipe, silky wine, wine, wine pairing. Bookmark the permalink.